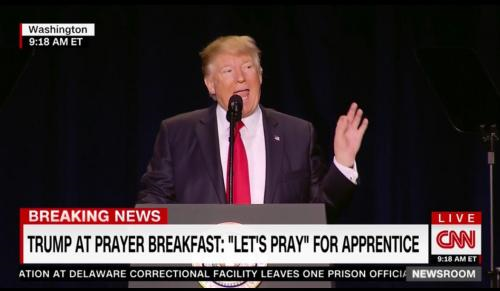 In a far-ranging speech addressing the National Prayer Breakfast, President President Trump took a shot at Arnold Schwarzenegger’s Celebrity Apprentice ratings – “total disaster” at the National Prayer Breakfast. Trump touched on Schwarzenegger’s horrendous Celebrity Apprentice ratings. The President commented, "We know how that turned out. The ratings went right down the tubes. It’s been a total disaster” since the show was rebooted with Former Ca Governor Arnold Schwarzenegger hosting. Trump said. “And I want to just pray for Arnold if we can, for those ratings,” he joked.